We perched on a terrace overhanging a sheer 1,000ft drop of rock and stone, surrounded by brooding mountains swathed in mist and cloud, and waited for dawn. Through the cloudburst, the first sunrays hit the ice-laden peaks in a fiery orange and descended from the cliffs to the foggy ruins, illuminating one stone building and one terraced garden at a time. The sight was so stunning that it moved some to tears, others to gasps of wonder. I just forgot to breathe. Sunrise at Machu Picchu is a memory I will hold on to till I am a very old woman. After years of scrutinizing pictures of the ruins, I had finally made it to the lost city of the Incas. The city that was created and used and abandoned, all within a space of 100 years. The city that the marauding Spaniards never found, even as they laid to waste the rest of the Inca empire in the mid-16th century. The city that was discovered in a remarkable state of preservation less than 100 years ago. The city that a poverty-wracked Peru is not equipped to protect, but desperately needs to, mainly from itself. At one of the site’s most significant sacred stone structures, the Intihuatana, or the “hitching post of the sun", our guide traced his finger along a long, thin crack that ran down the chipped stone. Resembling the Shiva lingam, this stone straddles the bridge between the two mountain peaks of Machu Picchu (old peak) and Wayna Picchu (young peak) and aligns perfectly with the sun on the two equinoxes in March and September. “The Instituto Nacional de Cultura (INC), in charge of Peru’s national heritage, allowed an ad agency to film a beer commercial at the site," he said, naming the government arm entrusted with safeguarding Machu Picchu. During the shoot in 2000, a crane smashed into the post and damaged the stone. The incident triggered a nationwide uproar that led to the site being sealed off and ended with the crane operator being sentenced to six years in jail. “Every day I see broken stone, every day I feel sad," the guide said. Despite all the controversies surrounding the 5 sq. miles (approx. 8km) that make up the ruins, Machu Picchu continues to dominate tourism in South America. Now ensconced among the new seven wonders of the world—during my visit, Peruvians across the country were accosting tourists to urge them to vote for the sight they’d come to see—it recently hit the headlines again after National Geographic named the Salkantey-Machu Picchu trail among the 25 best new trips for 2008. While the four-day Inca trail, used by 500 people every day, offers the easiest access to the ruins, the seven-day Salkantey route sees just 30 hikers daily, according to National Geographic, describing it as the savvy traveller’s alternative to the beaten path. Till a few years ago, tourists could land up in Cusco, the capital of the Incas, and simply follow the Inca trail to the medieval city. Now, hikers—only 200 a day, the rest of the numbers being made up by the support staff—need government permits, and trips have to be planned months in advance. Most tourists take the train from Cusco, 70km away, to the small town of Aguas Calientes, at the base of the mountain. Then they choose between walking up and taking the bus. I chose to walk. But even as I was focusing on my footsteps, a sudden shriek ripped through the mountain air. Did someone fall down? Who’s screaming? Almost as fast as my thoughts came a boy in a red knee-length garment, hurtling down from the stone steps above in a mad run. As I stared at his retreating back, a bus passed by. The boy froze, put his hand to his mouth and emitted that gut-wrenching scream again before disappearing around the bend. Later, an INC official at the ruins explained that the boy was one of several who race the bus to the base of the mountain. Since the bus takes a winding road down and the boys cut across the steep mountain slopes, they usually reach first. “But if the bus passes by them at any point, they scream to express distress. Once they reach the base, the boy collects money from the busload of tourists." “I gave him all the change I had. Two (approx. Rs80), maybe three, dollars," said my fellow traveller Nick Johnston from California, relaxing at a tiny restaurant at the base. “How can you turn down a boy you have seen run all the way down a 1,000-ft mountain?" On weekends, 20-odd of these boys from poor, neighbouring villages run against buses full of foreign tourists. “Every bus has about 30 passengers. Everyone gives about a dollar at least," Argentine Taylor Boland did the math. “At the least, a boy would probably make $20-25 a trip." Janet, an INC official in Aguas Calientes, said every boy made at least three or four runs every day. “Over the weekend, they would make anywhere between $150-200. It’s probably more money than their fathers make in a month. But the boys like it." It did look like they were having fun, Boland said. “I saw one of them drinking a Coke and eating a Twix bar." The boy he saw was Ari. Between my broken Spanish and Ari’s fractured English, we managed to talk. Like all the others, I too gave him a little money and bought him an ice cream. As I was about to leave Machu Picchu, Ari hopped on to my bench at the station, his feet dangling a little above the ground. A friendship had sprung up between us and he tugged at my hand and said, “Vote Machu Pichhu. New seven wonders. Promise?" Looking back at his toothy grin, I said, “You bet." I am not sure he got that, but he understood my grin. I did vote, Ari. So that the tourists keep coming. And boys like you earn more than your fathers did. From the Embassy of Peru, C-1/24, Vasant Vihar, New Delhi-110057. Tel: 011-26141154/26152294. Fax: 011-26141155. Visa cost Rs1,440. Apply for the visa well in advance as the process takes about four to five working days. Check for their long list of requirements. There are no direct flights between India and Peru. 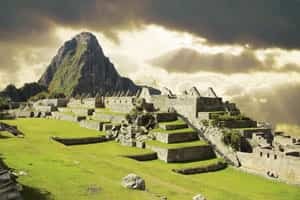 Use an American or European gateway (Miami is a popular choice) to fly to Lima and take a connecting flight to Cusco (a necessary night halt for Machu Picchu) on a Peruvian airline. There are three carriers—Lan Peru, Aero Condor and Star Peru—with three flights each way each day. Current fares are $108-120 (Rs4,300-4,800). Hotel Libertador (www.libertador.com.pe/) is supposed to be Cusco’s best five-star hotel; it’s a huge old mansion with a fine courtyard. Some parts of the building date back to the 16th century. Rooms cost upwards of $125 per night. The Royal Inka I (www.royalinkahotel.com/hcusco.html) offers quick and easy access to the main tourist attractions. This 300-year-old building was home to one of Peru’s most famous women, La Mariscala Gamarra (literally, the female marshal), who enjoyed supreme power while her husband General Gamarra was the nominal ruler of the country in the early 19th century. Rooms cost upwards of $60 per night. The Royal Inka II (www.royalinkahotel.com/hcusco1.html) doesn’t have the history, but is well located and offers a well-stocked bar for a Pisco Sour. Rooms cost upwards of $60. The Machu Picchu Sanctuary Lodge (machupicchu.orient-express.com/web/omac) is the only option for those seeking to spend a night next to the citadel of the ruins. Rooms cost $715-1,165 per night. Head to the cobblestoned Main Plaza at the Cusco city centre, dotted with fountains, benches and street lamps, and surrounded by several churches and cathedrals. There are some great restaurants and shops here and even a Govinda Vegetarian Restaurant on Espaderos. Visit Machu Picchu, pretty much. Book train tickets going from Cusco to Aguas Calientes online at www.perurail.com. A return ticket on the basic backpacker train costs $73. The vistadome train ticket costs $113 and throws in a ride through a valley on a glass-topped train, a meal and a fashion show. You can buy entry tickets to Machu Picchu at your hotel lobby in Cusco or in the town office in Aguas Calientes. The entry ticket costs $60.